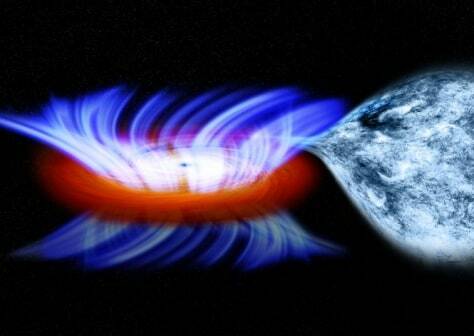 This artist's impression shows a binary system containing a stellar-mass black hole called IGR J17091-3624. The strong gravity of the black hole, on the left, is pulling gas away from a companion star on the right. This gas forms a disk of hot gas around the black hole, and the wind is driven off this disk at 20 million mph.